'Fired' tee shirts told a dramatic story of the teacher bashing policies of the Obama administration. George and Annie Mclaughlin taught at Central Falls High School in Central Falls, Rhode Island, until they were fired along with every teacher in the school in February 2010. President Obama praised the firing, although he didn't know any of the teachers or the students, as part of Obama's Secretary of Education's "turnaround" policy. Some of the teachers were eventually brought back after a natioinal outcry (the Mclaughins found positions in another district), but the damage by Obama and Duncan had been done, with Central Falls High School gaining a national reputation as a "failing school" according to officials in the U.S. government. 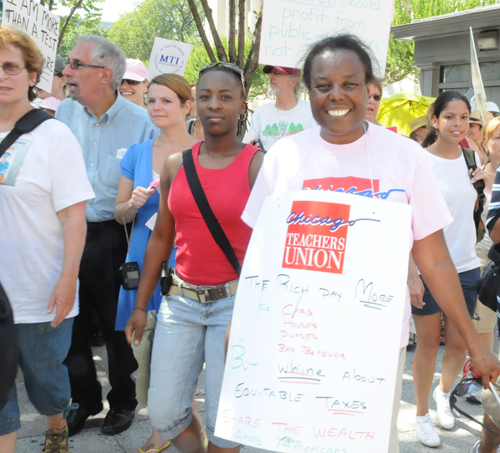 Although there was no national outcry because of the fired teachers of Chicago, there have been continual community protests throughout the city for the thousands of Chicago public school teachers (most of them black) who lost their jobs due to the more than 50 schools closed or consolidated or subjected to turnaround under the leadership of Arne Duncan. Substance photo by Sharon Schmidt.After years of suffering test-based education policies that include school closings, job losses, student pressure and grade retention over test scores and loss of valuable education opportunities — teachers, parents, and students from throughout the nation came to Washington D.C. to protest on July 30, 2011. 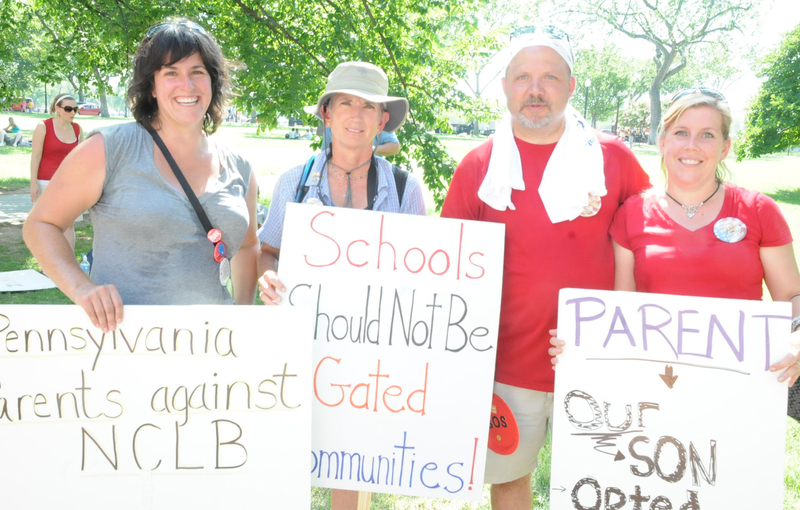 Northside Learning Center teacher Paula Jacko (right) came to the march with other Chicago Teachers Union members. She marched with Deanna Vaughn, a Washington D.C. public school teacher. 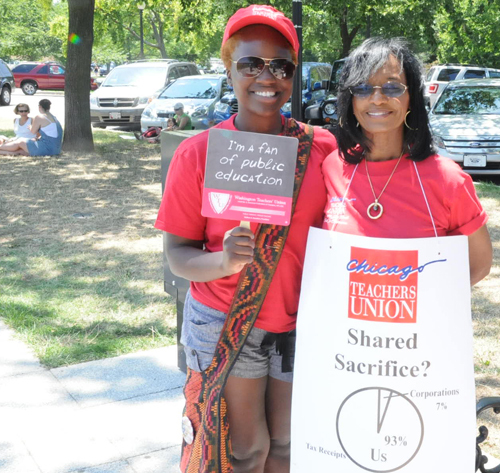 Although Chicago teachers had many of the signs that have been used in Chicago protests, many told Substance that a large banner, such as was utilized by other teacher unions, would have helped Chicago establish itself at SOS. Substance photo by Sharon Schmidt.We needed to march, to yell, to chant, to share our reality. After two days of the SOS conference workshops and movies — and the hours of inspiring speeches, poetry, music, and baking in the sun at the pre-march rally — it felt great to march. New York public school teachers Sasha Dos-Czarnocka, Genevieve Davis, and Rebekah Adams (as well as thousands of other marchers), take their message to the White House. Substance photo by Sharon Schmidt.We marched with others from all over the country who also get it. We were no longer isolated. 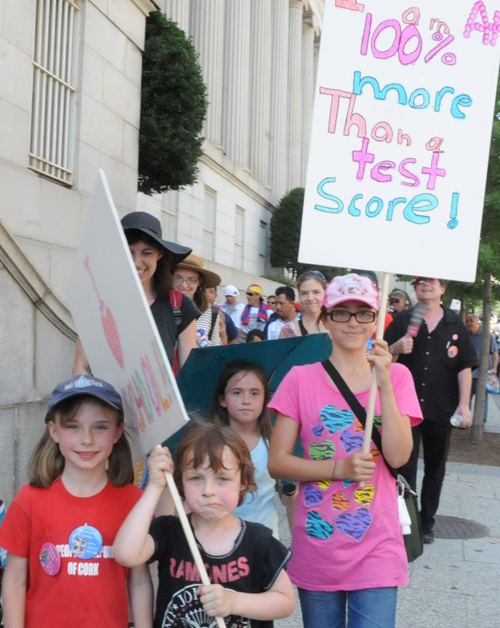 We marched in solidarity with thousands, demanding the end of corporate, test-based school reform. And we marched, as one speaker, Matt Damon put it best, on behalf of millions. Penn State professor and parent (who opts out her child from the Pennsylvania state tests) Terri Vescio, Park Forest school principal Donan Stoicovy, parents Tim and Michelle Slekar, who also opt our their child from excessive standardized tests. Tim Slekar, a former second grade teacher now in higher education, writes for Huffington Post and is beginning a national opt-out movement for parents. Stoicovy informs the parents in her Pennsylvania school of their right to opt out. "I'm just doing my job," she told Substance. As part of the opt-out process, parents sign a confidentiality form and read through the test before submitting their letter to opt-out. 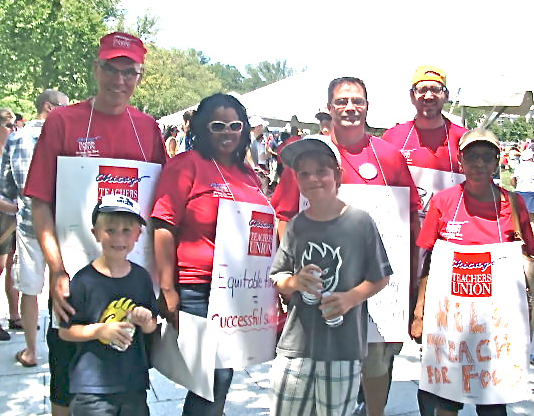 The AFT and NEA were sponsors of the march, both national education labor unions donating $25,000 to the conference and march. 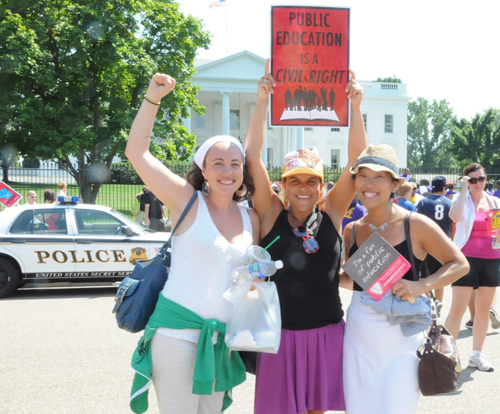 Many teacher union locals, including Boston, St. Paul, Los Angeles, Washington D.C., carried banners. 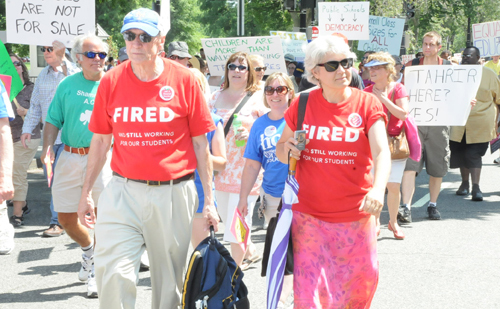 Above, members of the famous Boston Teachers Union (AFT) march behind their banner. Substance photo by Sharon Schmidt. Among the Chicago Teachers Union members and activists at the rally and march were Lee White (retired from Chicago Vocational), veteran teacher Suzanne Dunne (fired from her teaching job at Prescott Elementary by a "New Leaders for New Schools" principal in June 2010 due to the Chicago Board of Education dubious budget cuts), and Substance's George N. Schmimdt (fired from his teaching job in September 2000 for publishing six of 22 CASE tests, Chicago Academic Standards Exams, in Substance). Despite the obstacles, all promised to continue the struggle. Substance photo by Sharon Schmidt. 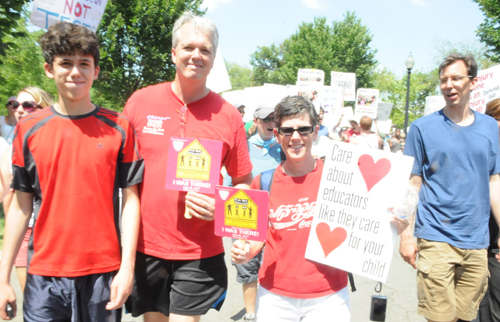 Teacher activists from New York, Baltimore and Chicago — Brian Jones, Alan Rebar, and Ed Hershey — meet at the SOS March on Washington. All of them veteran teachers, some, like Brian Jones, have been working overtime on things that brought everyone to the conference, rally and march. Jones is one of the teachers who brought "The Inconvenient Truth Behind Waiting for Superman" to audiences in all 50 states and across the world since it was debuted in New York City three months ago. The showing of the movie at the SOS conference the night before the rally and march brought a standing ovation from the more than 250 teachers and others who screened it at American University. Substance photo by Sharon Schmidt. 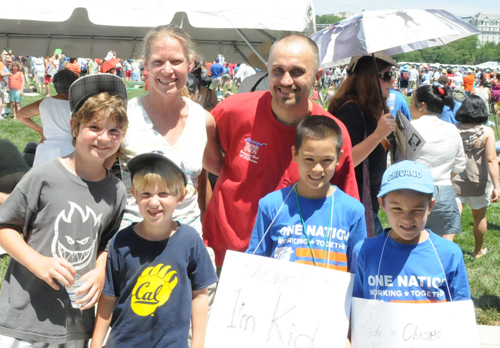 Chicago teacher James Klock marched with his suitcase (just prior to leaving town) after hearing about the SOS March at the National Board Certified Teacher (NCBT) conference he attended in D.C. during the days prior to the rally and march. 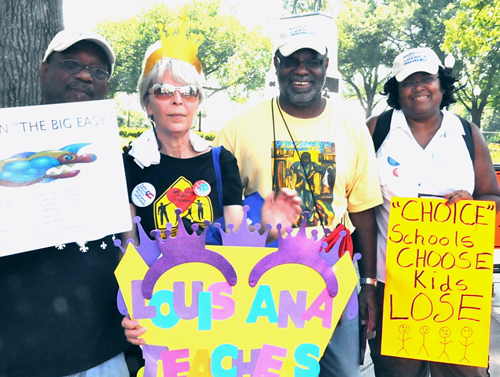 Many NBCT teachers have participated in the work that led to the SOS conference, rally and march, especially in Chicago. Substance photo by Sharon Schmidt. 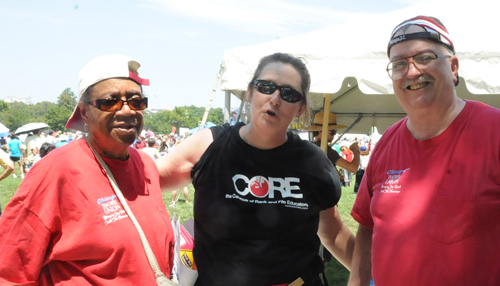 Chicago teacher Kathy Murry joined CTU members on the bus from Chicago. Although she didn't know anyone on the trip when the odyssey began, she joined the group because going to the SOS march "is an important thing to do," she told Substance. Substance photo by Sharon Schmidt. Newly retired Steinmetz high school teacher John Muhr (left) joined fellow Chicagoans (including Sam Schmidt and Josh Schmidt, who attend Chicago's O.A. Thorp public school) at the SOS rally. 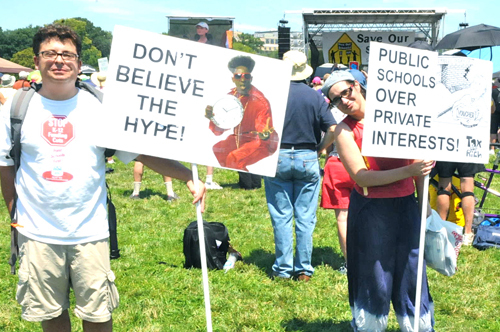 The rally participants ranged in age from one or two to retired teachers in their sixties, seventies and eighties despite the heat. Substance photo by Sharon Schmidt. Chicago teachers Robert Pollard and Anne Hopkins with their son Jack Pollard. Substance photo by Sharon Schmidt. Chicago teachers spend time in the shaded areas outside Washington D.C.'s Elipse where the rally was held. Substance photo by Sharon Schmidt. 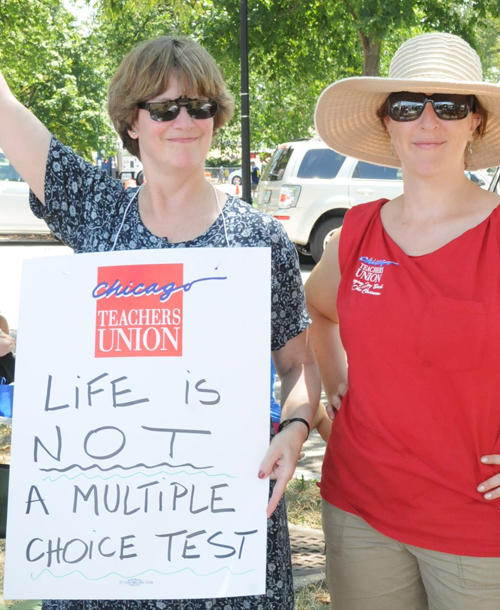 Chicago teachers MaryBeth Brandt and Rachel Mayer. Substance photo by Sharon Schmidt. Durham, N.C. teachers Dov Rosenberg and Hanna Kraus-Friedberg. Hanna told Substance she feels "really, really strongly that my students are great, but they're getting the short end of the stick." Substance photo by Sharon Schmidt. 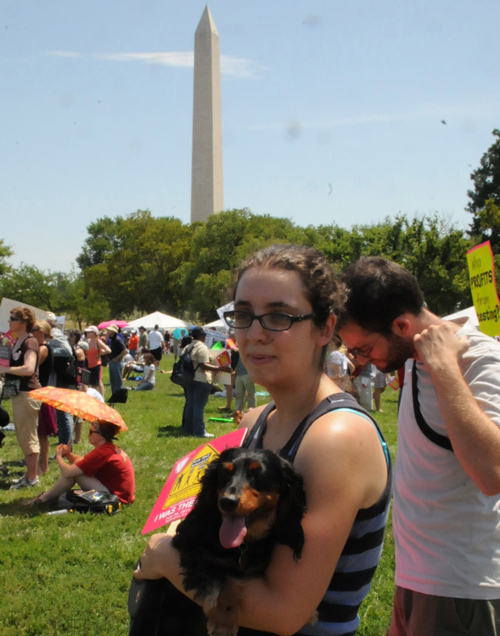 Washington D.C. teacher Laura Fuchs with dog Pan. Substance photo by Sharon Schmidt. 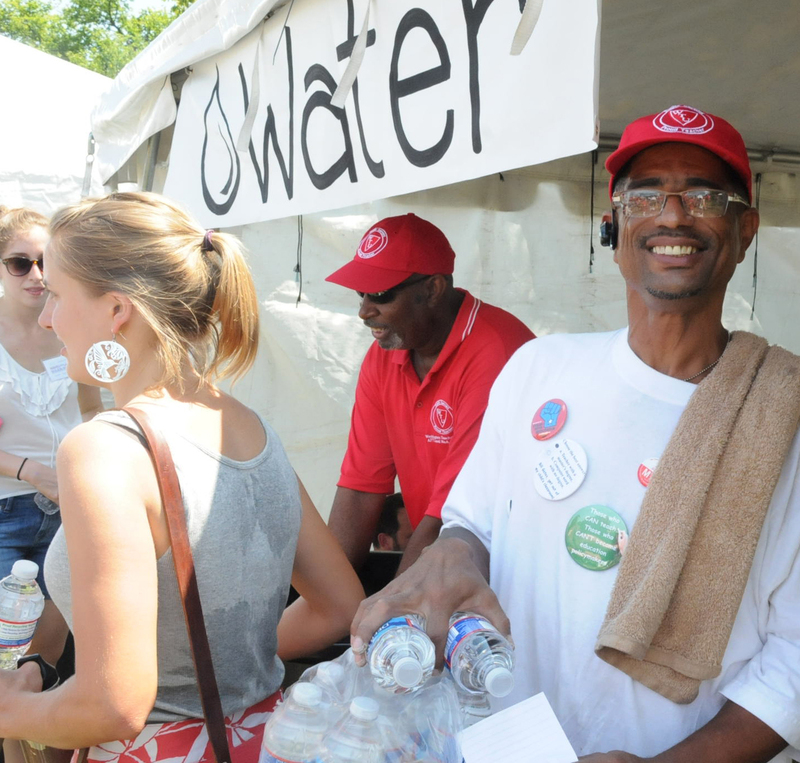 "I'm with the cause," said Roy Williams, who was handing out waters at the rally. "I'm promoting solidarity." Substance photo by Sharon Schmidt. New York City teacher D.J. Hogan with his son Paul Hogan. Substance photo by Sharon Schmidt. 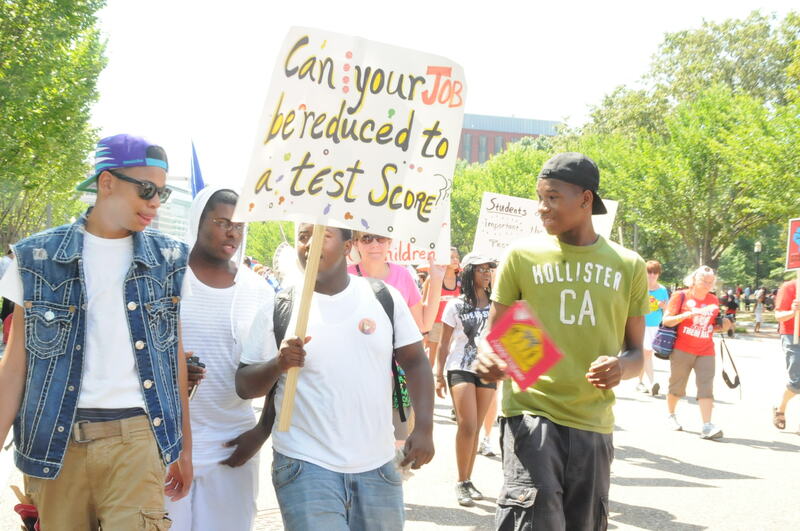 Newark, NJ students at the SOS march, July 30, 2011. Those who can, do. Those who can do more, teach. A charter school is not superman. The real heroes are public school teachers. David Guggenheim never went to a public school. Neither did his children. Our schools are not for sale. Save our Schools. I survived NCLB. My students shouldn’t have to! Can your job be reduced to a test score? 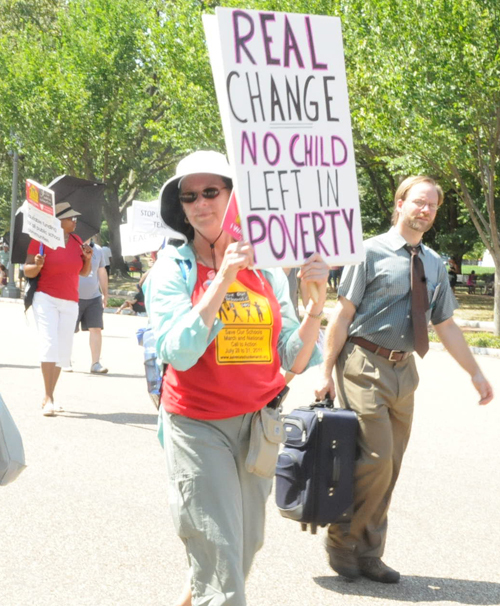 Real change: No child left in poverty. Save our schools: Marching to end injustice in education. National rally and march. I was there. July 30, 2011. Washington D.C. (Fan compliments of WTU). Dr. Bruce E. Levine, clinical psychologist and author of books including Get Up, Stand Up: Uniting Populists, Energizing the Defeated, and Battling the Corporate Elite. Susan Ohanian, longtime educator and author of books including Why is Corporate America Bashing our Public Schools and What Happened to Recess and Why Are Our Children Struggling in Kindergarten? Dr. Renate Caine, teacher, professor, and Director of Research and Professional Development of the Natural Learning Research Institute. Yvonne & Robert Flame Lamothe, independent filmmakers and creators of TEACH: Teachers are Talking, is the Nation Listening? GREAT pictures, Sharon. Thank you. I got home feeling guilty I didn't write down peoples' names. You did a masterful job. Sharon, your writing and approach are so fresh and to the point. I congratulate you on presenting such a clear picture (and pictures) of what went on. First rally where whole family joined in.